Celebrate Colo's 57th Birthday on Dec. 22! The Columbus Zoo and Aquarium has a well-earned reputation for excellent conservation work, going all the way back to 1956, when Colo, the zoo&apos;s matriarch gorilla was born. She was the first gorilla ever born in captivity, and today, she&apos;s still going strong as the oldest gorilla on record. 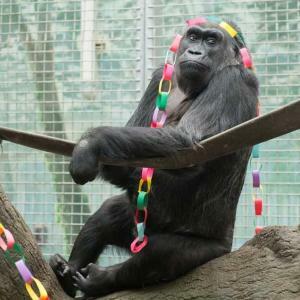 This Sunday, Dec. 22, starting at 1:30 p.m. log on to http://birthdays.columbuszoo.org/colo for some pre-recorded interviews with those closest to the birthday girl and stick around until 2 p.m. when a live feed from the Congo Expedition region of the Columbus Zoo will begin, giving you a front row seat to the party when Colo receives her presents and cake. Wondering what a 57-year-old gorilla’s presents and cake are? Colo receives wrapped presents filled with her favorite treats which include clementines, tomatoes and berries. Her cake this year will consist of peanut butter, applesauce, shredded carrots and honey, along with some typical ingredients like flour. The frosting is going to be Greek yogurt that will be dyed yellow with an edible screen printing of Colo’s heart-shaped face. Some treats that she enjoys, such as tomatoes, star fruit and macadamia nuts will be used to garnish the top. In the late 60’s and early 70’s Colo gave birth to three children and now her family tree includes 16 grandchildren, ten great-grandchildren and three great-great-grandchildren. While one daughter, two grandchildren and one great grandchild reside at the Columbus Zoo many of Colo’s descendants can be found in zoos across the country. There are approximately 120,000 western lowland gorillas left in the wild. The numbers of wild gorillas are declining due to poaching, habitat destruction, and diseases like Ebola. The Columbus Zoo supports several great ape projects including the Mbeli Bai Study of western lowland gorillas based in the Republic of Congo, the Cross River Gorilla Project in Cameroon and Nigeria, and the Goualougo Triangle Ape Project in Central Africa. The Zoo is a long-term supporter of the Pan African Sanctuary Alliance (PASA), and in 2010, joined the Association of Zoos and Aquariums Ape Taxon Advisory Group Initiative as a platinum member. In 1991, the Columbus Zoo founded Partners in Conservation to conduct conservation and humanitarian programs benefiting both wildlife and people in Rwanda and the Democratic Republic of Congo (DRC). Each year the Columbus Zoo contributes $1 million of privately raised funds to more than 70 conservation projects in 30 countries.